Cleaning is a vital step of the Inspect Before You Connect (IBYC) process, and like everything, there are choices to make and techniques to consider. Depending on the quantity of fiber optic cables you are cleaning, your level of experience, and the environment in which you are cleaning, some methods may be more effective than others. In episodes 6-9 of our Inspect Before You Connect video series, Tyler Vander Ploeg (VIAVI) interviews cleaning expert Brian Teague (MicroCare) to explore some common cleaning pitfalls. 1. What’s better? A Cleaning Stick or a Clicker? Cleaning sticks are effective tools and very practical especially for lower fiber count jobs, like a 24-fiber patch panel. The key to success with a cleaning stick is using the right technique to prevent further contamination, such as always rotating in the same direction. When used correctly, cleaning sticks are highly effective. Alternatively, Clickers are very popular for high fiber counts, like a 288-fiber panel. But be aware of the tendency to “over-click”, creating a static charge that could actually pull in more contaminants to the endface. Check out Episode 6 for a deep dive into the Clicker vs. Stick debate. 2. Are you creating more contamination with your cleaning technique? The #1 cause of contamination of endfaces is dust particles, and often electrostatic charge is to blame. Where does it come from? If you aren’t using your Click tool appropriately you could generate a triboelectric charge, which is a frictional charge just like when kids shuffle their feet across the carpet. Static charge could be a technician’s self-inflicted nightmare – learn how to avoid it in Episode 7 where Brian Teague shares some “shocking” best practices. 3. What are the best cleaning solvents and when should you use them? One of the best ways to clean anything is the Wet-Dry method. It helps avoid the static charge challenge but introduces other risks which you should be aware of. For instance, Isopropyl Alcohol has become very popular for fiber optic cleaning, yet it could be cross-contaminating the endface by pulling in water from the environment around you. The key to a good Wet-Dry fiber cleaning process is applying a small amount of cleaning solution, applying the cleaner with solvent, and then following it up with a cleaner without solvent. Learn more tips about how the Wet-Dry process can be your solution for difficult, embedded debris in Episode 8 of our IBYC video series. 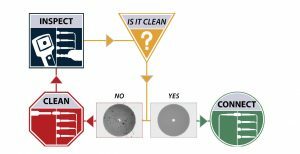 Clearly, cleaning is vital for completing the Inspect, Clean, Inspect again steps of the IBYC process, but you could run yourself in circles if your technique is reintroducing contamination. BONUS TIP: Once you’ve decided what tool type is right for the job, which vendor will you purchase them from? There are a variety of cleaning manufacturers on the market. In Episode 9 Brian talks through the importance of reliable fiber optic cleaning tools and when price shouldn’t be your only purchase criteria. Avoid some frustration and understand what tools to use when, and what to avoid. Visit viavisolutions.com/inspect for more inspection and cleaning tips and best practices. Next PostAre you being “smart” about OTDR Testing?